This month we removed the Samsung Galaxy S7, S7 Edge, Moto Z, and Moto Z Force to make room for the Galaxy S8, S8 Plus, and HTC U11. The Samsung Galaxy Note 9 was one of the most anticipated releases of the year. As is the case every time, the latest Galaxy Note certainly delivers once again, with the latest and greatest from Samsung remaining the epitome of powerhouse. It shares a lot of its design language with its predecessor, but flatter sides and more refined design elements like the better placement of the fingerprint scanner and a smaller camera visor give the Galaxy Note 9 the edge over the Galaxy Note 8. Samsung certainly knows how to make a premium looking smartphone, and the Galaxy Note 9 is no exception. There’s no risk of compromise in terms of hardware as far as the Galaxy Note 9 is concerned. You get everything and the kitchen sink built into this phone. You get the Snapdragon 845 processor onboard, backed by 6GB or 8GB of RAM. Up to 512GB of built-in storage is a power users dream, and keeping everything running is a 4,000mAh battery. The device also comes with a microSD card slot that allows you to expand the memory by an additional 512GB. Of course, Samsung continues to excel in a couple of key departments – the display and the camera. The Galaxy Note 9 features the best smartphone display around, with numbers to back that up. On the camera side of things, you get the exact same setup as is available with the Galaxy S9 Plus but with a few software tricks to further enhance an already excellent camera experience. Some may consider that Galaxy Note 9 to be a slightly bigger Galaxy S9 Plus. And that isn’t too far from the truth. However, what makes the Galaxy Note 9 that much more appealing is its defining characteristic – the S-Pen. Samsung has continued to bring more value and convenience with the stylus, and the S-Pen with the Galaxy Note 9 comes with a lot of new features and capabilities. Galaxy Note 9 vs Galaxy Note 8 – worth the upgrade? The LG V40 ThinQ is another underrated flagship from the company that is a great choice, particularly for those looking for an excellent audio experience with their smartphone. Unsurprisingly, the LG V40 is a true 2018 flagship, coming with a Qualcomm Snapdragon 845, 6GB of RAM and 64GB of storage. What makes it stand out from the competition though is the audio. LG’s famous 32-bit DAC brings high-fidelity audio which sounds better than just about any other smartphone right now. LG is committed to filling the high-quality audio niche. If you’d rather play music directly from your phone, LG also included its Boombox speakers from the LG G7 in this device. Apart from being one of the few phones to retain the 3.5mm headphone jack and the excellent audio, another aspect that makes the V40 stand out is its design and build quality. You get an IP68 rating for protection against dust and water, which some have come to expect from a flagship. However, the device also comes with a MIL-STD 810G certification for protection from bumps and drops, which is something very few smartphones offer without compromising the look of the phone. The LG V40 ThinQ may come with just 64GB of built-in storage, but the good news is that expandable storage via microSD is available, allowing for up to an additional 512GB of storage. Since launch, the LG V40 has also received a price cut and is currently priced at around $700. The Samsung Galaxy S9 and Galaxy S9 Plus may appear quite similar to their predecessors, but they actually feature quite a few upgrades and improvements across the board. The overall design language remains largely the same, now with reduced bezels above and below the gorgeous infinity displays for a more manageable handling experience. The fingerprint scanner has also been moved to a much better position and no longer feels like an awkward stretch to reach. Samsung also finally decided to focus on an area with which its struggled in the past — audio. The Galaxy S9 devices are the first Samsung smartphones to feature stereo speakers tuned by AKG. Samsung also partnered with Dolby to add the Atmos codec to the Galaxy S9 to provide an enhanced, immersive experience. The Galaxy S9 camera is a 12MP super speed dual pixel sensor, while its larger sibling tacks on a secondary 12MP telephoto lens. There a bunch of new software features like multi-frame image processing, and 960 fps slo-mo video capture, and the camera even has a dual-aperture lens. Apart from the larger display and the dual rear camera setup, the Galaxy S9 Plus also comes with 6GB of RAM, compared to 4GB with the Galaxy S9. If you’re looking for a great camera and don’t want to splurge on the Galaxy Note 9, the Galaxy S9 and Galaxy S9 Plus are definitely more than up to the task. Dual rear camera setups have almost become standard in the smartphone space. 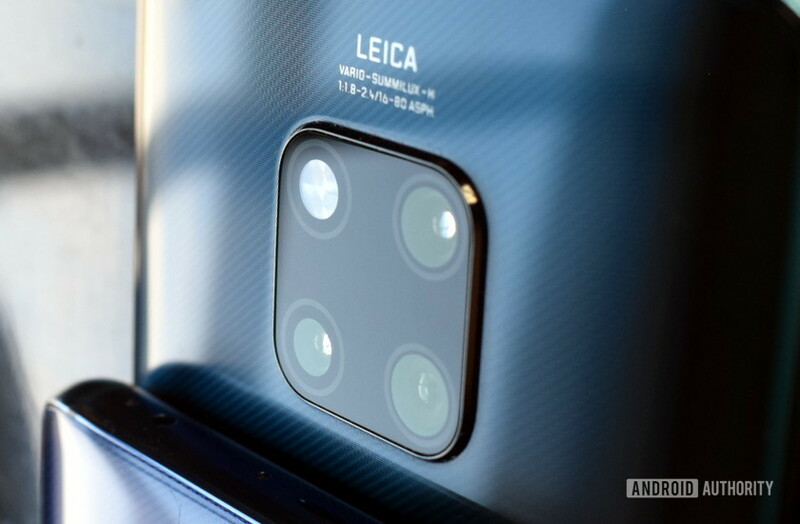 So of course, Huawei had to push the boundary and tack on a third camera with its latest flagship, the P20 Pro. However, this is more than just a gimmick. The P20 Pro has one of the best smartphone cameras around, offering a DSLR-like experience and quality. Each camera serves a different purpose. The main 40MP sensor captures rich color, the 20MP secondary monochrome sensor captures additional details, and the third 8MP telephoto lens is used for zoom and additional focal length. A bunch of features like 3X optical zoom, 5X hybrid zoom, 4D predictive focus, 960fps slo-mo recording, and more are available. The camera also has Huawei’s new AI-assisted stabilization (AIS), which lets the P20 Pro take long-exposure shots without a tripod. You also get a great 24MP shooter up front. However, it’s not all about the camera (though that’s more than enough reason to buy this phone for some). You also get excellent performance, courtesy of its flagship hardware, and impressive battery life, and a Full HD+ display. The P20 Pro is also a beautifully designed smartphone. The Huawei Mate 20 Pro is one of the most anticipated phones of the year, and for good reason. The Mate 20 Pro features an all-glass design and comes with Huawei’s popular gradient color scheme with five color options to choose from. The device comes with the Kirin 980 SoC, 6GB of RAM, and 128GB of storage. It’s blazing fast, has great battery life, and some of the best cameras you can get on any smartphone. That said, it won’t be easy to get your hands on if you’re in the U.S where the phone is unlikely to be officially released. It will be on sale in various European and Asian markets though, priced at around the $1000 mark (depending on the market). The reason the Huawei Mate 20 Pro is a special mention though is the new Nano Memory slot that it uses for expandable storage. The standard microSD card doesn’t work with this device. Instead, you’ll have to get Huawei nano memory card and likely a nano memory card reader to be able to take advantage of the expandable storage capabilities of this device. This is a bit unfortunate, as this is easily one of the best phones on the market but for expandable storage — this is certainly not one of the best choices unless you don’t mind going with a proprietary system. Apart from being significantly smaller than a micro SD card, there is no real advantage to the nano memory card. The read/write speeds aren’t any faster than usual, they can be hard to buy, and are quite expensive. The 128GB nano memory card from Huawei is currently priced at around 50 Euro (~$65) on Amazon (in markets where the phone is available). Buy now on Amazon U.K.
Those are our favorite smartphones with expandable storage! Do you have a favorite that’s not listed? Is microSD support even a big deal to you? Hit the comments to let us know!